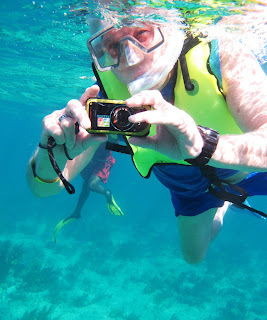 While on a cruise in the Western Caribbean, Larry and I booked a snorkeling excursion at Belize. The speed boat from Chukka Tour Company picked us up from the Crown Princess and went directly to our snorkeling spot, 25 minutes from the ship. After stopping briefly at Goff’s Caye for people to get snorkeling gear (we had our own), the boat headed out to the reef. 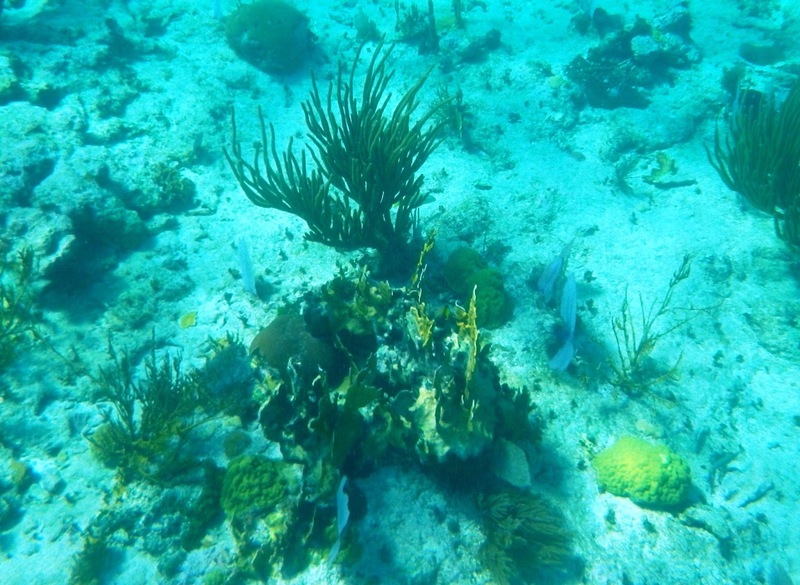 Many varieties of coral are found at the Belize Reef. First time snorkelers, accompanied by several guides, got off in shallower water, but within the first few minutes two people decided this wasn’t for them. Experienced snorkelers/strong swimmers are taken further out to the edge of the reef. We jump over the side of the boat into pleasantly cool water. 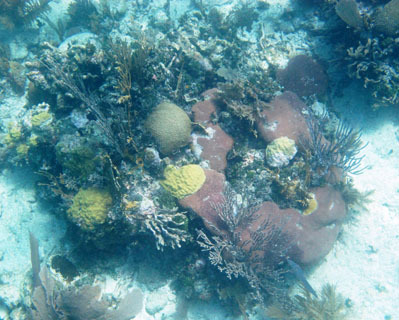 Coral in many different shapes and sizes is scattered; colors are muted. 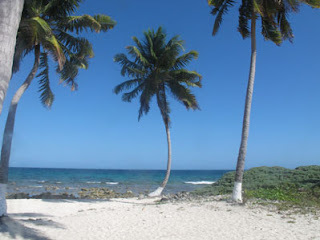 Belize consists of hundreds of islands and the largest barrier reef in the Western Hemisphere. The Belize Barrier, which runs for 560 miles along the Atlantic, is second in the world (the Great Barrier Reef of Australia is the largest). Only an estimated 10 percent of the sea creatures around it have been classified. To prevent damage to the reef, cruise ships must anchor miles offshore and tender visitors to land. the water, waves splashing over our bodies. Swimming against the current back to the taxi boat was a bit more challenging. 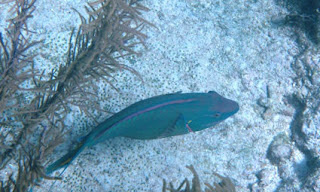 With our snorkel masks on, we view fish darting around: Yellow with white stripes, blue iridescent, small black, tiny yellow, white and gray, and long, skinny needle fish. Star fish resemble large spiders with long tentacles. For 45 minutes we float, swim, observe, and enjoy being in the ocean. Larry takes pictures of fish and coral. Once everyone was on board, the boat sped back to the island for relaxation time. Rum punch flowed freely, and food was available for purchase, although we had brought our own snacks. The sandy beach led to a rocky shoreline. Quintensential palm trees gave the small island a lovely tropical feel, so we enjoyed the restorative ambience of our Belize retreat. Almost half of Belize is protected habitat. This makes for a variety of nature excursions where visitors can explore caves, rivers, and rainforests with exotic tropical flora and fauna. The jungle is home to 570 bird and orchid species. Temperatures fluctuate from the mid 70s to mid 90s year-round. We soon realize that Belize has three distinct worlds, each appealing to a different kind of tourist: traditional touring and shopping venues; activities like ziplining, cave tubing, and horsebackriding; and water sports for divers, snorkelers, kayakers, and surfers. You can take trolley tour across the oldest swing bridge in Central America and the only manually operated swing bridge in the world that’s still functioning. In 1862, it became a British Crown Colony and part of Jamaica. British Honduras became Belize in 1973 and gained independence in 1981. Belize is the northernmost Central American nation and the only one where English is the official language. Goff's Caye has palm trees and a sandy beach. Although Mayans occupied the country 5,000 years ago, shipwrecked English seamen founded the first settlement in 1638. Hurricanes have been the bane of Belize. A storm in 1931 destroyed two-thirds of the structures and killed more than 1,000 people. Hurricanes in 1955, 1961, and others since have caused millions of dollars in damage. Still, there are plenty of ways to enjoy this relatively unspoiled environment, which is why it’s a favorite port for cruise ships.